I regret to inform you that due to lack of interest in the 2010 Bowl to End Poverty, we have had to cancel this event. Thank you all who have taken the time to raise funds and encourage others to participate. If you know anyone who would still like to contribute to People Helping People Global, please direct them to our donation page. Thank you so much, and have a great day! 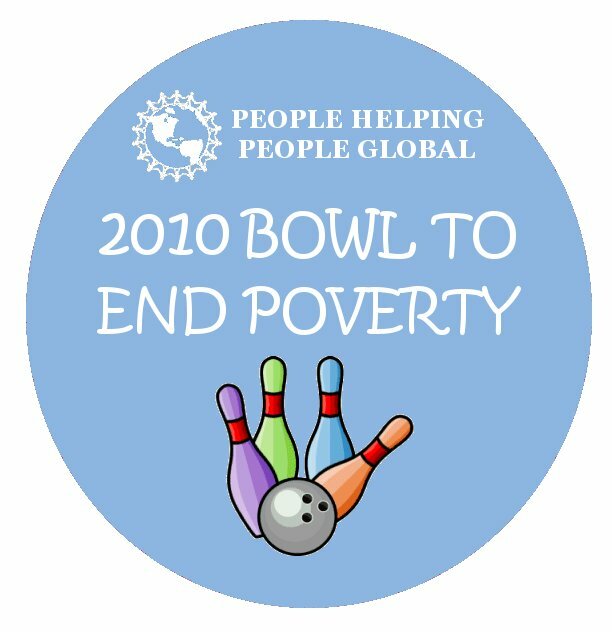 Richmond, VA, Friday, July 23, 2010 – People Helping People Global (PHPG) is looking for event sponsors and participants for its 2010 Bowl to End Poverty. The event will take place on Thursday, August 12 from 5 to 7, Friday, August 13 from 5 to 7, and Saturday, August 14 from 2 to 4, at AMF Shrader Lanes, 8037 Shrader Rd. in Henrico County. The three-day event – which includes 2 hours of free bowling, event t-shirts, and raffle prizes – is a thank you to all of those individuals who raise at least $50 for PHPG. “In these hard economic times, organizations have to look to different methods of fundraising. In this case, we tried to reward our fundraisers with something in return for their hard work,” said Isabel Gamm, co-Founder and Program Manager of PHPG. The money raised at this event will go towards expanding the organization’s existing micro-lending projects in Central America. “The great thing about micro-lending is that you’re empowering individuals to help themselves escape poverty. Plus, after they pay the loan back, someone else can use the funds to do the same thing. It creates a ripple effect in the communities,” said Alex Tuck, co-Founder and Executive Director of PHPG. The organization is asking that anyone who is interested in bowling or becoming an event sponsor or prize sponsor visit the event website, www.phpglobal.dojiggy.com, or call (804) 859-5597 for more information. People Helping People Global is a project of Building New Hope, a registered 501(c)3 non-profit organization. It partners with locals in impoverished regions of the world to develop sustainable economic initiatives. It currently focuses on providing zero percent interest micro-loans to individuals living on less than two dollars per day.